About a week ago, we have seen that the Sprint branded Nexus 5 gets the Android 4.4.3 KitKat update and now it looks like that the Android 4.4.3 has decided to arrive on other Smartphones too, as the Sony Xperia Z Ultra Google Play Edition will also get the Android 4.4.3 KitKat update soon. All credit goes to the Bluetooth SIG and according to them, the Sony Xperia Z Ultra GPE has passed the certification for the latest version of Android which is 4.4.3 KitKat. 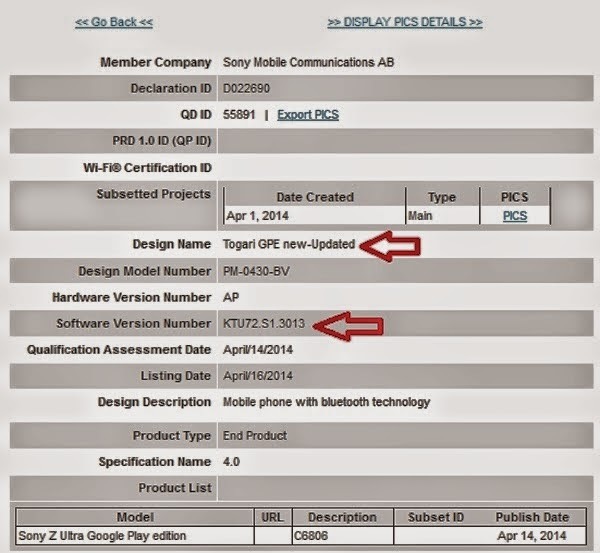 The Sony's Phablet has cleared the certification with the build number KTU72.S1.3013. Now we can say that the other Google Play Edition devices will soon upgrade to the latest Android 4.4.3 and this is the point to be happy for those who owns the Google Play Edition devices. Stay tuned with the AndroidSaS to get more updates on it.